Lengthy research and a little serendipity brought together two DeLand residents from separate universities and centuries. On the club-sports scene, active participation is the big win. Stetson’s Community Education Project is taking the value of study to prison. The lessons are being well-received and raising the value of human spirit among the students. Editor Michael Candelaria Designers Megan Danna, Michelle Martin, Brittany Strozzo Art and Photography Bobby Fishbough, Faith Jones, Joel Jones, Brittany Strozzo, Matt Adair Writers Sandra Carr, Rick de Yampert Marie Dinklage, Wendy B. Libby, Ph.D., Brandi Palmer, Jack Roth, Jared Smith ’14, M.F.A. ’17, Jared Scott Tesler, John Tichenor, Ph.D., Trish Wieland Class Notes Editor Cathy Foster STETSON UNIVERSITY MAGAZINE is published three times a year by Stetson University, DeLand, FL 32723, and is distributed to its alumni, families, friends, faculty and staff. The magazine is printed on FSC-certified paper. The College of Arts and Sciences, School of Business Administration and School of Music are at the historic main campus in DeLand. The College of Law is in Gulfport/St. Petersburg. The university also has two satellite centers: the Tampa Law Center and the Stetson University Center at Celebration near Orlando. Want to add, remove or change your magazine subscription? With a student-exchange program involving Bishkek, Kyrgyzstan — that’s Central Asia — a new world opens for students while two universities grow closer. From rolling up sleeves with local business owners to visiting Loch Ness, and even growing fond of black pudding and sausage, students “step out of their comfort zones” during Summer Scotland. Graduate students in the Department of Counselor Education are learning very real lessons using make-believe. Read how learning about learning can happen without us even knowing. One alumna, propelled by experiencing the world, offers a friendly embrace along with a scientific study of migration, violence and climate change. Learning from experience no longer is an option at the School of Business Administration. It’s both necessary and required. 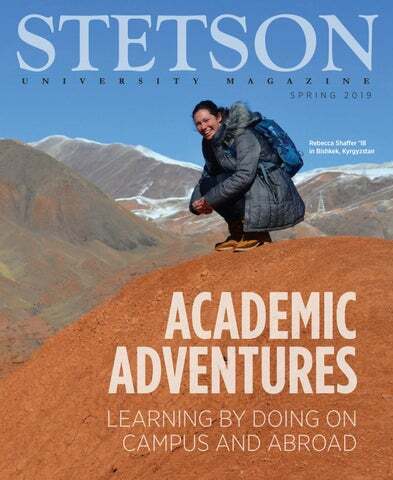 ON THE COVER: Rebecca Shaffer ’18 (Russian, Eastern European and Eurasian Studies) spent her final semester before graduation as the first Stetson student to participate in an exchange program with the American University of Central Asia in Bishkek, Kyrgyzstan. Shaffer is shown on the Tian Shan Mountains that border China. Higher education is a dynamic and complex field, and our mission is a social and moral imperative. We are in the business of nurturing curiosity in our students, of sparking possibility, of creating lifelong learners. It is an exciting threshold at which to stand with our students. There’s a great deal of reflection that occurs when you elect to retire, or make a similar big decision to move on to another phase of your life — the next great adventure. My retirement comes in June 2020. It has been a privilege to have served as president of Stetson over the past decade, and I am deeply proud of the work we have all accomplished together. It is gratifying to reflect on how we’ve doubled the university’s endowment, recruited more students into Stetson to meet our capacity and raised more than $200 million in our Beyond Success – Significance fundraising campaign to strengthen Stetson’s future. My route from my undergrad days as a biology student to the college presidency of two remarkable institutions has not been linear, but I would not have wanted it any other way. Each bend in the road has been an adventure. Higher education is a dynamic and complex field, and our mission is a social and moral imperative. We are in the business of nurturing curiosity in our students, of sparking possibility, of creating lifelong learners. It is an exciting threshold at which to stand with our students. Because the world is also dynamic and complex, we do not teach the mindset and skills for the moment or for the task before us, but for a lifetime. Knowing what you don’t know — and setting your sights upward, on a path of learning, however winding it may be — is the first step. This issue of the magazine is devoted to the journey of learning. In its pages, Michael Eskenazi, Ph.D., reminds us that we are learning even when we don’t realize it. Sage words from one of our professors, who also shares fascinating findings about how our brain processes what we read. Our faculty and others in this issue teach us about play therapy, studying in other countries and being immersed in cultures, and also about lessons learned in a classroom of men at the Tomoka Correctional Institution in Daytona Beach. My perspective on incarceration is forever changed due to my own experience guest-teaching there; learning breeds confidence, it gives you value and hope for the future. It’s what I want for all of us, at whatever age and in whatever situation we find ourselves. Spending a career on a college campus surrounded by learners keeps you young and invested in creating a better future — in part because every day we look head-on into the eyes of new generations of students, and we cannot let them down. For we know what they can become — I need only look at Stetson alumni to see the possibilities. I am grateful for every alum I’ve met, for I learn something in these encounters and in your stories. The same is said for the many lecturers, artists, visiting professors and other guests who pass through our campuses over time — there’s always something enriching to discover in conversations with others. Such experiences can have lasting, profound effects. This is what a career in higher education has given me, and why so many of us make our lives here or support financially the university’s mission and its students. The ever-changing dynamic of knowledge and discovery, the constant coming and going of people, all make for an innovative exchange of ideas. It is an experience akin to flinging the door wide open, welcoming whatever the day has in store for you next. Here’s to the next great adventure for us all! The Coffee Shop features expanded offerings and remains a popular place to relax. CUB Transformation Complete On an appropriately sunny day in late January, Stetson President Wendy B. Libby, Ph.D., stood on the steps of the Carlton Union Building and said she had “waited a long time for this day.” “I think my husband Richard and I have been waiting for this day since Sept. 14, 2008, when we first saw this building on a Friday night at 7 o’clock,” she told a crowd of local dignitaries, university trustees, benefactors, alumni, students, faculty and staff. (For a related story, see Page 22.) “There were no students in it because there were no services and everything looked really tired and the bathroom fan hadn’t worked for 20 years,” she said to laughter. “And we looked at each other and we said, ‘We know how to fix this.’ And so, what a treat — what a real treat — to be here for this ribbon-cutting.” A decade after Libby was named Stetson’s new president and two years after its renovations began, the CUB has been transformed. DID YOU KNOW? Inside the two-story, 84,320-square-foot Carlton Union Building: •	First floor: Commons dining room and kitchen, Coffee Shop and patio, Faculty/Staff Lounge, Bookstore, Post Office, Einstein Brothers Bagels, Johnny Rocket’s, George’s Place (outside patio) •	Second floor: Student gathering spaces, lounge, meeting rooms and offices; student media; WHAT Radio; Student Government Association; Lee’s Garage; Stetson Room; offices for Campus Life and Student Success (CLaSS) •	Project cost: $32 million •	Builder: Williams Company Building Division Inc.
•	Architect: Hanbury Architecture •	Funding: from a variety of sources for the design, construction and renovation, including an investment by Chartwells Dining Services, Stetson University and gifts. Donors include Geoff and Kay Jollay, Christine E. Lynn and the E.M. Lynn Foundation, and M. Lee McGraw and the Elizabeth B. McGraw Foundation, as well as many others. •	Building: named for Stetson alumnus Doyle E. Carlton 1909, who served as governor of Florida from 1929 to 1933. Carlton served Stetson as Chair of the Board of Trustees, Overseer of the College of Law and benefactor. A total of 231 rooftop solar panels are expected to result in an annual cost avoidance of almost $10,000. Faculty-led classes are a highlight of the Young Scholars program. DID YOU KNOW? In late January, Stetson University College of Law presented its Wm. Reece Smith Jr. Public Service Award to Bay Area Legal Services Inc. (Tampa) pioneer Richard C. Woltmann. In 1976, Woltmann established the elder law programs at Bay Area Legal Services, becoming chief executive officer/president of the organization in 1980. Prior to joining Bay Area Legal Services, he served for three years in the Peace Corps in West Africa and for one year as a VISTA lawyer in Washington state. Stetson established the Wm. Reece Smith Jr. Award in 1990 to honor outstanding contributions to public service, the justice system and the community. The award is named for the late Wm. Reece Smith Jr., a champion for justice and a national leader in the legal aid movement. Smith is a member of the Stetson Law Hall of Fame and the namesake of Stetsonâ&#x20AC;&#x2122;s Tampa Law Center Wm. Reece Smith Jr. Courtroom, and was a longtime member of both the Stetson Law Board of Overseers and the Stetson University Board of Trustees. Roger Hughes turned the Hatters program around last season, earning Pioneer Football League Coach of the Year. HIGHLIGHTING GILLESPIE. Appropriately enough, Stetson’s Gillespie Museum — a bedrock facility on campus for the past 60-plus years — is hosting “Florida Calcite: Rare Specimens of a Common Mineral” as its newest exhibit, through May 3. Calcium carbonate is the mineral that makes up most of the limestone formations throughout the Florida Peninsula. The exhibit features 39 specimens collected by geologist Tom Scott, Ph.D., during his decadeslong career with the Florida Geological Survey. On Nov. 14, 1958, the museum opened with a founding collection of 15,000 mineral specimens that were donated by Thomas Byrd and Nellie Parsons Gillespie of Palatka, Florida. Since those earliest days, the museum’s mission has been to educate about mineralogy, geology and the environment. DID YOU KNOW? The U.S. Air Force is offering Stetson students the opportunity to earn their private pilot’s license at no cost if they enroll in the AFROTC “You Can Fly” program — with no commitment to serve in the military. In exchange, students must enroll in the two courses needed in the first year of ROTC, Air Force 101 and Air Force 102, along with participating in four hours of fitness training and marching per week. The reason: a need for pilots, with the Air Force being approximately 5,000 pilots short, according to Air Force Capt. Daniel Speir, assistant professor of Aerospace Studies, Detachment 157, Air Force Reserve Officers’ Training Corps, at Embry-Riddle Aeronautical University in Daytona Beach, which also includes Stetson. Last August, Stetson welcomed the Air Force ROTC program to campus. The Jeffrey and Diane Ginsburg Hillel House opens its doors this fall. DID YOU KNOW? The Stetson University College of Law team of Elise Engle, LaMark McGreen, Grace Samarkos and Megan Tiralosi won the Chester Bedell Mock Trial Competition in late January — making Stetson the winner for the 23rd time in 37 years. A Stetson team won the inaugural Chester Bedell competition in 1983. Notably, Samarkos is the daughter of Charles Samarkos, J.D. ’89, who won the Chester Bedell competition when he was a student at Stetson. The Trial Lawyers Section of the Florida Bar conducts the competition for mock trial teams from across the state annually, and the final round of competition is presided over by distinguished members of the judiciary. Stetson Law 2016 alumni Brandon and Lara Breslow coached the team. Former NBA coach Stan Van Gundy now shares insight at the Lynn Business Center. Stetson Archives now has the 1893 diploma of the university’s first collegiate graduate. For new undergraduate students, Stetson admission now comes with a formal four-year plan for graduation and possible help with tuition. DID YOU KNOW? Stetson recently announced a new accelerated path to earning an accounting degree (see Page 13). Also, there’s now a new articulation agreement that will allow Seminole State College students who graduate with an Associate of Arts in accounting to seamlessly complete their Bachelor of Business Administration in Stetson’s accounting program. Students must complete the Seminole State A.A. degree program, submit application materials to Stetson and meet all requirements for admission, including a grade point average (GPA) of 2.75 or higher. The agreement takes effect immediately. University Concert Band Douglas Phillips, conductor 7:30 p.m., Lee Chapel, Elizabeth Hall Tickets available at the door: $10 adult, $5 youth (13-plus), free with Stetson ID Information: stetson.edu/music/calendar. theories. Color theory focuses on the visual effects of color, the harmonious relationships of color and how different colors affect each other. Over time, as Bluemner was developing his color theory, his application of color began to focus on an emotional understanding of the world around him. He bases his color on inner emotional observations, rather than reality. As Bluemner explained, “I work the usual way from Form to Color, reversed-from Color to Form; from our inward experiences to their outer realization, through creative imagination.” This personal application of color became a part of Bluemner’s trademark as an artist. Bluemner recognized that color was his driving force, and he even described it as “the beauty of color, as the primary objective of his works.” This exhibition explores one of the key factors of Bluemner’s works and hopes to provide a greater understanding of the ways that Bluemner considers color. The Importance of Being Earnest by Oscar Wilde Second Stage Theatre Times: April 11-13, 8 p.m.; April 14, 3 p.m. Jack Worthing has invented an alter ego named Ernest in order to court and win over the lovely Gwendolen. Unbeknownst to Jack, his good friend Algernon has adopted the same disguise so that he might have an opportunity to meet the lovely young Cecily. When all four characters flee to the country, disguises are revealed, and hilarity ensues. 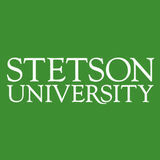 Information: stetson.edu/other/academics/ programs/theatre-arts.php. Tim Ludwig’s artistry of ceramic pots are “memories and visions from my experiences living around creative development,” he said, adding that “images are growth patterns taken from time reflecting on my life.” His work primarily is constructed on the potter’s wheel, and each piece is made one at a time by hand. “I use an earthenware red clay body that is brushed with white slip when the pieces are semi-dry,” Ludwig explained. “I mix ceramic stains with white slip to create the painted surfaces and images. The pieces are then fired in an electric kiln to 1910 degrees. The pots are stained in selected areas, and a thin clear glaze is applied.” Information: stetson.edu/hand-art-center. then unpeopled foreign architecture for color. None of those things talked back, and the only part of me they set alight was my imagination. Most importantly, they did not look back in anything other than a figurative sense. Photographing others is a different type of compact between the observed and the observer, but the implications of such a parlay cross a far greater number of lines. It’s only a small leap of faith into the idea that many of Georgia O’Keeffe’s most gorgeous flowers are drawn from her beau Alfred Stieglitz’s photographic interrogation into another taboo entirely; that the two artists shared a forbidden muse does not do anything to ameliorate the mystery between them. Many of the prints in that specific collection are still “classified,” with a knowledgeable source slipping only far enough to state that they “play out a darker chapter in the relationship between the photographer and his subject.” American photographer and author Diane Arbus went further, saying that she could “see the suicide” on her subject’s faces, if only in certain cases. These ideas induce in me an irreducible fear, and so I have spent a lot of time avoiding such collaborations. Call it trauma, or lack of practice, or lack of non-traumatic practice, but I am just not much for people. It was a big step for me when I started photographing my cat, figuring as I did that he owed me for feeding him on a consistent basis. Eventually, I think he began to enjoy it. The first catch in this image is that as collaborators, my cat and I will never quite be equals. In his mind, I will always be a peon, and he will always be the ruler of the known universe. Exposing human beings means both parties are inextricably party to one another’s inherent human weaknesses and inherited human flaws, and that can cause plenty of discomfort for all involved. I was at a loss for how to surmount the obstacle and had resigned myself to documenting ol’ Jebediah’s retirement from the DASHES — Domesticated American Short Hair Event Streetscrapping — circuit when an actual person deposited herself in my inbox: “I need someone to take photos during and between events, and to help pick up/drop off our special guest artists/writers from the airport in Daytona. I’d also love to have a few short video clips with students, guests, faculty, about the program, that can be used in a video promo piece. Is this something you’d be interested in? Based on your Santiago photos, I know you have a great eye. Let me know, and I hope you’re well.” Warmly, Teresa Carmody As in Teresa Carmody, Ph.D., professor and director of the M.F.A. of the Americas program that I was about to graduate from at Stetson. I proceeded to mansplain my amateurism to her over the phone, and she took me on anyway. I didn’t have a choice then: photograph people or face the disappointment of a woman who had traveled across the country to take a job away from her family in the name of advancing the arts. She paid me upfront, so I bought a new camera. No pressure. The second catch in that cat photograph is that it was taken with automatic settings. Sure, I raised the animal, paid rent on the setting, and framed the composition, but the parameters of the exposure were decided upon without me — as were those of all the Santiago photos that Professor Carmody mentioned in her email. I was sitting in the Black Box Theater at the Atlantic Center for the Arts, snapping the inaugural graduate reading in “auto,” when I decided to shut the computer off. “Oh, those look very nice,” Cyriaco Lopes, M.F.A., my urbane visual poetics professor, told me. “Just remember, the little screen on the back of the camera is a liar.” “I shot the whole thing in manual. First time,” I replied. He clapped me on the back and told me to never shoot in grayscale, just change it later in postproduction. I did not tell him that I had done it to more thoroughly understand how light, aperture, the International Organization of Standardization and shutter speed interact in real time, and that I didn’t want color messing up my learning experience. The thought strobing through my skull when I made the decision was, “You will never have a better opportunity to learn this than right now,” and the results that night bore out the intuition. The photographs over the remainder of the residency alternated between “mad decent” and “maddeningly inconsistent.” Uncontrollable oranges and focus flaws that doubled as fireable offenses meant my capture rate (the percentage of snapped photos that might be considered viewable) nose-dived. Far left: The author’s trusted photography subject: the Honorable Commodore Jebediah Bizzle-Wizzle-Bo (retired). Above: “Nope,” featuring Catherine Hunt Weiss, at The Black Box Theater, Atlantic Center for the Arts, January 2018. Right: Teresa Carmody, Ph.D., professor and director of the MFA of the Americas program at Stetson (shown at AWP 2018 conference). With characteristic foresight, Libby made the announcement well beyond the one year required by her contract, enabling Stetson and its Board of Trustees to have the benefit of searching for a 10th president during the most advantageous part of the academic recruitment cycle. Consider the highlights of the university’s accomplishments during her tenure: •	Undergraduate enrollment has increased nearly 50 percent to an all-time high of 3,150 students on the DeLand campus and 4,340 across all four of Stetson’s campuses in Fall 2018. •	Academic programs have been introduced such as the Centurion Sales Program in the School of Business Administration and the Master of Fine Arts of the Americas in creative writing in the College of Arts and Sciences. •	A robust and focused collegewide program of undergraduate research has grown and the Advocacy Center and Veterans Law Institute in the College of Law have been created. •	While continuing to recruit the best students for Stetson, academic quality measures have been enhanced and marketing strategies sharpened, which have helped to counter difficult national enrollment trends in higher education. •	Academic programs and partnerships have grown, with both the number of faculty and faculty salaries rising. •	The university’s endowment has more than doubled to $246plus million, and operating funds spent on faculty salaries in DeLand and Celebration increased by 70 percent, with more than 50 new faculty positions added to keep pace with student enrollment. •	The Marshall and Vera Lea Rinker Welcome Center, the Athletic Training Center and the newly dedicated Sandra Stetson Aquatic Center were constructed, and the Carlton Union Building underwent significant renovation, including an increase in size of nearly 50 percent. •	Plans are underway to construct a new Health and Science building, following receipt of an $18 million campaign gift in April 2018 from longtime benefactors Hyatt and Cici Brown. It is the largest single gift in Stetson’s history. Sgt. Paul Levering Hon is remembered on the Tablets of the Missing at the Aisne-Marne Cemetery in Belleau, France, not far from where he died. HONoring History Lengthy research and a little serendipity brought together two DeLand residents from separate universities and centuries. ou never know what you might find when conducting research about history. Society. He played on the baseball team, while joining the Green Room Club, a theater group, and performing a role in Shakespeare’s “A Midsummer Night’s Dream.” For good measure, Hon was president of his sophomore class and a member of the Stetson Choir. Also, his brother, Howard, was a Hatter at the same time. Klements found photos, too, by flipping through the Stetson yearbooks of 1916, 1917 and 1918. Klements recounted, with eyes widened: “When I first saw his name, I was like, ‘yes.’ Then I found his picture in a group, and I was like, ‘Which one is he? Which one is he?’ I couldn’t figure it out.” Eventually, Klements did. A description by business classmates in the 1917 yearbook claimed that Hon’s ambition was to “play,” while his gift was “intelligence” and his favorite pastime was “callin’ at Chaudoin Hall,” a women’sonly residence hall on campus. As for his military story, Paul Hon enlisted as a private in the Army Engineering Corps in May 1917, a month after the United States declared war on Germany. He had just completed his sophomore year. That August, his division shipped out to France, and in May 1918 Hon became a sergeant. Two months later, in July, his division engaged in the Aisne-Marne campaign. There, on July 22, around his 20th birthday, Hon died on a battlefield in Belleau, France. His remains were never recovered or identified. In Stetson’s 1919 yearbook, a memorial page for Hon contained the following passage: “Our hero is dead. He died for liberty — he died for us. … Earth may turn red with other wars — he is at peace.” The Hon family legacy extended long after Paul’s death. His youngest sister married into another prominent family, the Johnsons, and there was a son named Chauncey Paul Johnson, known as C. Paul Johnson. Later, he became a Stetson University benefactor. And so it went. Passion. Culture. Leadership. Friendship. Those are only a handful of the benefits that Stetson students are gaining through the university’s vibrant club-sports programs. Nearly 400 students are actively involved in 17 club sports — where they can find a “manageable balance” of competition with “less responsibility for conditioning, practicing and travel obligations,” according to Travis Potter, Stetson’s assistant director of wellness and recreation. Winning and losing are just a small part of the game. Ultimate Frisbee is one of 17 club sports at Stetson, which attracts nearly 400 students. A focus on fun and friends is widely evident with each club, such as equestrian (on left), surf (below) and cycling (lower left). Students can find a “manageable balance” of competition with “less responsibility for conditioning, practicing and travel obligations,” said Travis Potter, Stetson’s assistant director of wellness and recreation. Club Aikido (below) features a Japanese modern art, and Club Soccer (below, right) is the most diverse club on campus. Club Softball (on right), meanwhile, showcases personality. Hunter Brown ’19, an aquatic and marine biology major with a minor in environmental studies, has been affiliated with men’s Club Soccer since his first year at Stetson. There, according to Potter, Brown has helped strengthen the program tremendously in the past two years. In addition, Brown serves Hunter Brown ’19 on the Club Sports Council. “Hunter knows firsthand how the skills that club officers gain can transfer into post-graduation skills,” Potter said. “Through being on the council, I’ve become a leader that I never really anticipated,” Brown said. “You get the opportunity to move up the ranks and possibly hold executive positions in your club that translate to real things you can put on your résumé.” Notably, men’s Club Soccer is the most diverse club on campus, with membership that’s consistently composed of 50 percent international students. Flag football, anyone? All are welcome on campus. Club Top Hats (below) happily meets its financial needs solely through fundraising initiatives. Last fall, Stetsonâ&#x20AC;&#x2122;s Community Education Project offered its first creditbearing course at the Tomoka Correctional Institution in Daytona Beach. During the Fall 2018 semester, participation was limited to 18 students, who applied for admission. With grant funding, the program could be expanded to 30 students this fall. Reform and its Research Impact Award. The program received its original seed funding through the Hollis Renaissance Fund. A grant from the Laughing Gull Foundation, awarded in June 2018 at $70,000 annually for three years, will provide textbooks and school supplies, support students’ emerging scholarship and creative course projects, plus fund the addition of a computer lab. The grant also will enable Eisen to take on the official role of project coordinator and increase his presence at the prison, where along with teaching he tutors incarcerated students and serves as a liaison with the state Department of Corrections. With resources limited, helping hands are almost everywhere. Notably, the current lack of computers didn’t deter Joshua Eckroth, Ph.D., assistant professor of computer science, from devising a “super ingenious way of teaching coding through the use of cards,” Hall noted, adding, “It was awesome seeing how that worked.” During the fall semester, the CEP was capped at 18 students, with application and review steps closely resembling Stetson’s admissions process on campus. The Laughing Gull grant will help with plans to expand the program to 30 students in the coming year. REAL EDUCATION Petrovic “wanted to do something more with my teaching, but I wasn’t thinking much about it” until she encountered the passion of Eisen and Cappas-Toro to establish the prison program. “That reaction of people — ‘Oh, I never thought about going there’ — that’s purposeful, to never see people who are incarcerated as members of our communities,” Petrovic said. “What you see in the media shapes how you feel, the language we use to talk about people who are incarcerated. We refer to them as inmates, prisoners, felons; all of these things that mark them as outsiders from our communities. “Hopefully, the work we are doing and the work of the students who are incarcerated will change that, so that we start seeing them as members not just of our communities but as members of this campus. We’re treating these people as Stetson students.” That attitude informs the coursework, where lessons aren’t “dumbed down” or altered for presentation at the prison. “I’m teaching the same class at Tomoka that I am here on campus. Same writing expectations, same midterm, same final exam,” Eisen said. “Teaching at the Tomoka Correctional Institution fits squarely into our mission. That our faculty have been so enormously supportive underscores how clearly this work aligns with Stetson’s values.” — President Wendy B. Libby, Ph.D.
Bishkek and Beyond With a student-exchange program involving Bishkek, Kyrgyzstan — that’s Central Asia — a new world opens for students while two universities grow closer. ebecca Shaffer graduated from Stetson in 2018 with a degree in Russian, Eastern European and Eurasian Studies. A rewarding college experience, assuredly. Yet not your typical course of study. Then there was spring 2018. A studentexchange program, one that few other universities offer, gave her a semester of a lifetime — at the American University of Central Asia in Bishkek, Kyrgyzstan. Last summer, Stetson traveled to share ideas about education with the American University of Central Asia. Stetson participants, from left: Paula Hentz; Michael Denner, Ph.D.; and Mayhill Fowler, Ph.D. To the right of Fowler is Asel Umetalieva, head of the International Students Office at AUCA. The building behind them is the AUCA dormitory. The summer visit to Bishkek brought a mix of business and pleasure — including marketplace shopping, meetings and a bit of downtime for the Stetson group. Few universities offer such a student-exchange similar to the Stetson/AUCA program. Directly above: Neri Ordaz ’16 and Callie Rades ’16 are alumni who had been teaching English in Bishkek. Ordaz now is in a fully funded graduate program at the Higher School of Economics in Moscow, Russia. Rades is teaching at the Silk Road School in Bishkek and planning to pursue graduate studies in library information sciences. Ala-Too, Kyrgyzstan’s main square in Bishkek, offers a scenic setting. Stetson Professor Eugene Huskey, Ph.D., began visiting Kyrgyzstan right after the collapse of the Soviet Union and now is widely considered an expert on the region, knowing many of the movers and shakers in Kyrgyz politics personally. His new book, “Encounters at the Edge of the Muslim World,” published in September 2018, not only is a political science exploration of democratic transition, but also a thoughtful narrative about what it means to learn a new culture, language and place in a time of change, according to reviews. The book even includes a personal note of support written by the former Kyrgyzstan President Roza Otunbayeva, whom Huskey knew before she was president, and includes the story of famous Kyrgyz writer Chingiz Aitmatov’s visit to Stetson University in 1991. Stetson Professor Eugene Huskey, Ph.D.
As part of case-study projects, students work with local companies on real-world business issues. Above: Summer Scotland is centered at The University of the Highlands and Islands - Inverness College. Left: Students pause for a portrait of fellowship at the Quiraing on the Isle of Skye. Below: Ample camaraderie is evident among students and faculty, with the Urquhart Castle in the background. Students who participate in the summer program earn four credits upon completion. Above: Students investigate the legend of Loch Ness, the deepest lake in the United Kingdom. Right: Here’s a literal sign of Stetson’s impact at the Quiraing. Second from the left (standing) is Paula Hentz, director, WORLD: The David and Leighan Rinker Center for International Learning at Stetson. Third from the right is Carol Azab, Ph.D., assistant professor of marketing. Far right is Neal Mero, Ph.D., dean and professor of management, School of Business Administration. The others are students. “When I see students presenting at the end of the program, I feel so proud. ... It’s a life-changing experience for these students, who come back more enlightened and also improve academically.” — Carol Azab, Ph.D. The Therapy of Play Graduate students in the Department of Counselor Education are learning very real lessons using make-believe. art Simpson, Scooby-Doo, the Powerpuff Girls, SpongeBob SquarePants, Bugs Bunny and other cartoon characters are teaching Stetson graduate students the power of play. “Play is the first language children learn,” said Gloria Lopez, a Clinical Mental Health Counseling graduate student who also is earning certificates in play therapy and school counseling. “A lot of people outside the clinical realm might see therapy as just sitting down in that empty chair and saying, ‘Tell me how you feel’ to a client. Play therapy is working with your unconscious and expressing yourself through more than just talking.” That’s where those cartoon characters — or, rather, miniature plastic figures of them and many others — come into play. Venture into the Department of Counselor Education’s play-therapy room at Flagler Hall and you step into a child’s paradise stuffed with Buzz Lightyear, Clifford the Big Red Dog, My Little Pony, Mr. Potato Head and Hot Wheels, along with teddy bears, a sand tray (tabletop sandbox), plastic toy people, soldiers, dogs, horses, dinosaurs and more. Some spooky stuff lurks in the play-therapy room, too: plastic skulls, skeletons, snakes, a creepy witch and even a miniature black casket with the white block letters RIP. Lopez and the 11 other students in the play-therapy program are getting real-world, hands-on experience bringing characters to life for children in need through service learning. Meanwhile, the Counselor Education graduate program is very real — with the blessing of the Council for Accreditation of Counseling and Related Educational Programs, which accredits master’s and doctoral degree programs in counseling and its specialties offered by colleges and universities in the United States and throughout the world. Stetson’s Counselor Education graduate students can specialize in either Clinical Mental Health Counseling or Marriage, Couple and Family Counseling. Regardless of program choice, students are guaranteed a highly experiential-learning environment. The Play Therapy Certificate Program service learning lab is a prime example. Under faculty supervision, the Stetson play-therapy students work at various locations of Head Start in Volusia County. A program of the U.S. Department of Health and Human Services, Head Start provides early-childhood education, health, nutrition and parent involvement services to low-income children and their families. “Play is the child’s first language. They communicate, learn and grow by doing. So, you can communicate with them through that play and learn about their inner worlds and the workings of their minds by understanding their play.” — Page Thanasiu, Ph.D.
Graduate student Gloria Lopez ’19 and 11 other students receive realworld experience bringing characters to life for children in need. inside of us, and accessing it through some of the play-therapy techniques and interventions sort of accesses the kid in everyone.” Thanasiu taught and supervised the hands-on lab at Head Start for the first two years after founding the play therapy program at Stetson in 2014. Soni McCarty, a Longwood-based licensed clinician, currently heads the lab. McCarty meets with two Head Start behavioral specialists to identify children in need and the severity of the need. Stetson students are introduced into the process incrementally. “When I was supervising the lab, we had a child who had been severely sexually traumatized. So, I took that client as my own because of my levels of training and experience,” Thanasiu stated as an example. “I would not have had one of the students who was just starting to practice do that, even though they have a very strong basic set of skills at that point.” Students work with children who may be facing “a lack of structure at home or a variety of adverse experiences that have left them struggling with some very intense emotions,” Thanasiu said. Essentially, for the graduate students it’s all about learning by doing. Page Thanasiu, Ph.D., is an assistant professor of counselor education at Stetson and a Registered Play Therapist-Supervisor. In the Department of Counselor Education’s play-therapy room, toys help to “reach” both children and adults, with the hope of accessing thought processes that impact behaviors. Word Association Read how learning about learning can happen without us even knowing. alk about experiential learning at its very core. In a demonstration, Bailey Nix ’19, a REAiD Lab research assistant, is tracking the eyes of fellow research assistant Marissa Weis, ’20. Below is an example of a single-line experiment that can measure participants’ ability to learn novel words (in this case, the word “otiose”). or Rebecca Williams ’01, the migrant caravan at the U.S. border tells a story that she has witnessed firsthand as a research scientist in Honduras. The caravan is made up of mostly women and children, reflecting the increasing desperation at home due to gang violence, domestic violence, poverty and a corrupt government that does not protect its citizens, said Williams, Ph.D., an assistant research scientist at the University of Florida’s Office for Global Research Engagement. And now Williams is working to identify an even larger force behind the migration — climate change. In January, she began a $200,000 study in Honduras for the U.S. Agency for International Development (USAID) that will examine whether climate change is fueling the country’s escalating violence and mass migrations. Her findings will help set the agency’s policies in that country for the next five years. The USAID study is “relevant to what we’re seeing in the news right now,” she said. Honduras is ranked third in the world among countries most affected by climate change, she explained, pointing out that extreme drought has destroyed crops, like corn and beans, which feed rural farmers and their families. And the country’s cash crop — coffee — has been plagued by a fungus, called coffee rust. Going to Honduras with the Peace Corps “changed everything for me,” said research scientist Rebecca Williams, who traveled there again as a graduate student at the University of Florida to work on a USAID project. Honduras is ranked third worldwide among countries most affected by climate change, according to Williams, who earned a doctorate in interdisciplinary ecology from the University of Florida. piano and organ, and was selected for the Presser Scholarship Award, given to the outstanding rising senior in the School of Music each year. He also started his daughter in clarinet lessons at age 11 with Stetson Professor of Clarinet Lynn Musco, D.M. And those lessons continued until Williams was 15 and the family moved to Colorado. “I finished high school out in Colorado, but to be honest, I kind of slacked my last years of high school,” Williams recalled. “I was kind of lost and unmotivated, and the only thing I was really good at and felt confident about was music.” At 17, she called her former music teacher and said she’d like to attend Stetson. Williams flew in for an audition, was accepted and received a partial scholarship. And, she added with a laugh, she was placed on academic probation for a year until she pulled up her grades, which she did, making the Dean’s List. Musco said she knew her former music student could handle college coursework. Williams has grown close to Hondurans, even helping a family through financial hardship. The sign over the door reads, “Biblioteca Rebecca J. Williams.” While a graduate student at UF, Williams volunteered to build a library for one community in Honduras, raising the funds in just a few weeks through social media and GoFundMe. “These four years for students at Stetson is the best time in their lives to figure out who they are and begin to pave the path to where they want to be. Sometimes all it takes is reassurance and someone believing in them to propel them to do significant things.” — Stetson Professor of Clarinet Lynn Musco, D.M. ‘Real Life. Right Now.’ Learning from experience no longer is an option at the School of Business Administration. It’s both necessary and required. BY JOHN TICHENOR, PH.D.
t was spring 2016, less than two weeks before the semester’s end, when a student who had been in my first-year seminar four years earlier came by my office and said, “Hi, Dr. Tichenor. I’m getting ready to graduate and wanted to stop by to see you.” I was happily surprised about the visit, proud that someone who had taken a course with me years ago wanted to see me before he departed Stetson for bigger and better things. As it turned out, the student really stopped by because he needed some serious advice. The conversation went something like this: I asked, “So, what are you going to be doing after you graduate?” He responded: “Well, that’s why I’m here. I need some advice. I don’t really have anything lined up.” Hesitating for a moment, I said, “OK … tell me about the internships or internship you completed.” There were crickets, nothing. He hadn’t done an internship. “OK, well, did you study abroad?” Again nothing. And the same when I inquired about his involvement in any business organizations or volunteer activities on campus. he surely would have gained at least some of the experience he needed. I realized I could be disappointed in him, but I also needed to share some of that disappointment. This was something that, as educators, we had within our control, and we had to fix. Today, in the School of Business Administration, SOBA, we have such a fix in our Experiential Learning Requirement (ELR). Simply stated, all undergraduate business students must complete two significant experiential learning activities as a requirement for graduation. The ELR can be met through internships, study abroad or other significant learning experiences outside the classroom. In fact, throughout Stetson University, across all disciplines, experiential-learning requirements are infused into the curriculum. For example, I think of experiential learning for teachers in our Department of Education as “internships on steroids,” which is great. I should know. My wife, Mercedes Tichenor, Ph.D., has led the education internship program for many years. When education majors graduate and leave the program, they are completely prepared to enter the field as professional educators. Another example of experiential learning is the mandatory senior research requirement across the entire College of Arts and Sciences. Experiential learning isn’t new at Stetson, and it’s certainly not new in higher education. But we needed formality and consistency in SOBA. Now, we have it in the ELR, which will fall under the newly created JJ Master Center. (See sidebar box.) In Fall 2016, the semester following that fateful visit from the student and just before I went on sabbatical, I spoke with Dean Neal Mero, Ph.D., and told him that I would head up the ELR program when I returned from sabbatical — a program we had long discussed within SOBA. There were some logistics to be addressed and details to be worked out, but this wasn’t rocket science. It simply required communication and teamwork across the departments within the School of Business Administration and offices on campus such as Career and Professional Development, Admissions, WORLD, Financial Aid and the Registrar. The ELR Program went into effect at the beginning of Fall Semester 2017, and is all about gaining active experience beyond the traditional classroom and transferring learned course material to a real-world setting — with the end goal of a fulfilling future career. The ELR Program tagline is “Real life. Right now.” We want students to know that real life doesn’t begin after they graduate. By then, it’s far too late! The gate opens when students step onto campus. From the outset, the courses they begin to take prepare them for internships or study abroad, which, in turn, later help them get a job. While students may satisfy the ELR in a number of ways, “the gold standard” for me is a paid internship that leads to a job offer. But it doesn’t happen by accident. Much groundwork must occur beforehand. By the student. We will certainly be there to help. We just won’t do the work! Who gets the student an internship? The student does! This is about preparing them to get that real life, right now. Stetson provides a multitude of resources and assistance for students, both at SOBA and at the Career and Professional Development office. At SOBA, “experiential” has become a key component of the faculty-advising process. Our advising isn’t only about courses, but also about careers. For decades, our best students have completed internships at great accounting firms, finance offices, marketing agencies, and other businesses leading to job offers and fulfilling careers. That’s quite a rewarding achievement — for the student and the professors. Many students even start their senior years with job offers firmly in hand, because they’ve demonstrated knowledge and professionalism all along the way — in how they speak and present themselves in class, in organizations, during mock interviews, in preparing their résumé, and in their internships. Again, this is nothing new. What is new is that the process is now more formalized AND required of ALL business students. Will all business students respond to these new requirements? Absolutely. If not, they do not graduate. However, our goal is for students to see the ELR as much more than simply another box that must be checked to graduate. I recently visited one of our foundational courses, SOBA 205 – Professional Communications, designed for first- and second-year students as a gateway course into our business school curriculum. I was visiting the course to introduce the new ELR, and there happened to be a graduating senior in the class who does not need to meet the new graduation requirement. He came up to me after class and said, “I wish I had had that [experientiallearning] requirement!” It’s a reality at universities everywhere that some students will not take the extra step to get an internship or to study abroad or to seek a significant experiential learning activity without a mandate. As a result, we’ve raised the bar. And our students will jump over it. Real life. Right now. John Tichenor, Ph.D., is an associate professor of management and chair of the Department of Management within Stetson’s School of Business Administration. The JJ Master Center In the quest to produce the most professionally prepared business graduates globally, Stetson’s School of Business Administration has established The JJ Master Center, beginning this fall. Named in honor of the late Joe Master, a beloved professor of accounting, the center will coordinate all student professional and career development activities within SOBA, including the Experiential Learning Requirement; expanding the set of study-abroad opportunities for students to travel and study with faculty; and, among other initiatives, raising an additional $15,000 in scholarships to help students participate in international programs through the generosity of alumni and friends. Chris Williard As a first-year Hatter in spring 2017, Williard was named to the ASUN All-Freshman team. More success on the links followed last year. Now a junior, Williard is expected to rise to new heights by posting such low scores as the 66 he shot last year. Mitchell Senger How to achieve even more than the Hatters’ championship run of a year ago, which also included big success in the Major League Baseball player draft? The performance of Senger, a junior pitcher, will go a long way in answering that question. Collegiate Baseball Newspaper, the oldest media outlet dedicated to the coverage of college baseball, named the southpaw to its preseason All-America Second Team. Also, last summer Senger pitched for the USA Baseball Collegiate National Team. The Hatters host the ASUN Conference Tournament May 22-25. Season and single-game tickets are available for all Stetson Athletics events. For information, call 386-738-HATS (4287) or visit www.GoHatters.com/tix. Big things in women’s golf are expected from Lauer, a native of L’Étang-la-Ville, France, and a junior-transfer from Utah Valley State University. In her 10 tournaments last season, Lauer showed trademark consistency, recording five top-20 finishes and seven top-30 finishes. Lucie Renault Now a junior, Renault led the team with 14 singles victories in 2018 and was selected to the ASUN All-Freshman Team in 2017. During the ASUN Tournament last spring, Renault, from France, won twice in singles play and once in doubles. The Hatters host the ASUN Conference Tournament April 18-20. Ashly Smith One of the top hitters in Hatter women’s softball history, Smith returns in 2019 for her senior season. The left-handed-hitting first baseman batted .385 last season and earned second-team all-conference honors. Entering the spring, Smith ranked 12th in school history in home runs (15) and seventh in stolen bases (60). Tim Gennes A trio of first-year players offer great promise for the future of men’s tennis. Among them is Gennes, from Germany, who arrived at Stetson ranked No. 15 in Germany for his age group. Fellow newcomers Josh Laka of Australia and Christian Mills have similarly impressive tennis résumés. The Hatters host the ASUN Conference Tournament April 18-20. Katie Thurstin Thurstin appears to be building something special in her second season as the head coach of men’s and women’s rowing. Thurstin arrived at Stetson after spending four seasons as an assistant coach at Drake University in Iowa. The current women’s roster includes only two seniors among its 31 members, while the men’s 17-member team has three seniors. Rachel Noble Noble, a senior, enters the 2019 season needing only 20 wins to break the school-record for dual victories, as the Hatters seek a fourth consecutive ASUN title in beach volleyball. They won a schoolrecord 30 dual matches in 2018 and ranked 16th nationally in the final American Volleyball Coaches Association Poll. Stetson hosts the ASUN Conference Tournament April 18-20. Riley Reagan Reagan entered the spring as a preseason all-conference selection in women’s lacrosse. As a freshman last year, she earned second-team all-conference and ASUN All-Freshman Team honors. Reagan ended the regular season leading the ASUN with 35 assists, and her 53 total points were a Stetson record. Meet some of our future alumni who have publicly proclaimed (@ #newhatter) that they are Stetsonbound! Have a student you would like to recommend for Stetson? Contact admissions@stetson.edu. Social Hatters Stetson alumni spotted throughout the world on social media. Scott Uguccioni ’89, chief sales and marketing officer at Barnie’s Coffee & Tea Co.; and Maggie Pringle ’21, daughter of Doug Pringle ’91 and current intern at Barnie’s, attend the ribbon-cutting at the CUB, which now proudly serves Barnie’s coffee. NOVEMBER 8-10, 2019 STETSON.EDU/HOMECOMING Class reunions will include: 1969, 1974, 1979, 1984, 1989, 1994, 1999, 2004, 2009, 2014 and 2019! Special festivities will take place to celebrate the successful conclusion of the Beyond Success â&#x20AC;&#x201D; Significance fundraising campaign. William Breyer ’64, Indian Harbour Beach, retired in 2009 after 40 years, remains busy as a volunteer. He was first employed by the Boeing Co. during the Apollo program at Kennedy Space Center, followed by O.S.H.A. in Washington, D.C., and then the Air Force Space Command/Eastern Range at Patrick Air Force Base in Brevard County. Upon retirement, Breyer joined the National Veterans Homeless Support and the Space Coast Honor Flight organization. Since 2012, he has been a volunteer guide at Launch Complex 26, the “Explorer Satellite Launch Site” for the Air Force Space and Missile Museum at the Cape Canaveral Air Force Station. Ned B. Ricks ’68, Gurnee, Illinois, was named an “Honor 200” veteran recipient during the Illinois Bicentennial. The Illinois Department of Veterans’ Affairs and the Illinois Bicentennial Office announced the winners, honoring the work of 200 veterans who continue to make extraordinary contributions to the people of Illinois. form at Stetson.edu/ lawalumninews. We can only use photos that are high-resolution, and because of space limitations, we cannot guarantee use of all photographs. address the traumas and alienation of various marginalized social groups — prisoners, refugees, the elderly, those suffering from cognitive disabilities, gay youth and the socially disenfranchised. 1980s Lori Harrell Hershey ’87, Jacksonville, has been elected as Duval County’s new School Board chairwoman. Hershey represents District 7, encompassing Jacksonville’s Southside neighborhoods. H. James Kaighin ’88, M.B.A. ’90, Lake Park (shown on right), won his third RC Laser National Title, making him the 2019 National Champion. He won by a one-point margin with the lead changing three times during the race, which was hosted by the Sarasota Model Yacht Club. The RC Laser is a recognized class of the American Model Yachting Association. been appointed to the Florida Supreme Court’s Judicial Management Council. Marstiller is with the Gunster law firm’s appellate and government affairs teams, Tallahassee and Tampa offices. The council serves as high-level management consultants to the Supreme Court and is responsible for assisting the chief justice in identifying trends, potential crisis situations and the means to address them. Lori Keeton ’95, Charlotte, North Carolina, was selected to the 2018 North Carolina Super Lawyers list in the field of litigation. Keeton, who formed her own firm in February 2017, also has been named to Business North Carolina’s “Legal Elite” and The Best Lawyers in America. She is president-elect of the Mecklenburg Bar Foundation for 2018-2019 and will serve as president in 2019-2020. Christine Stile ’98, M.B.A. ’99, Mount Dora, has been elected to the Mount Dora City Council as a councilmember at-large. She has been a part of the downtown Community Redevelopment Advisory Committee, hosts a monthly book club and has helped to bring numerous New York Times’ best-selling authors to Mount Dora. 2000s Monica Spirig Smith ’02, Lake Mary, was named among the Orlando Business Journal’s 40 Under 40. Smith manages the operations of one of the Southeast’s fastest-growing PR agencies, Poston Communications. Jessica Parker Nugent ’05, Brooksville, moved their family to rural Kenya to serve at Tenwek Hospital. Following his residency in 2015, Dylan became the director of an orthopedic surgery residency program in Kenya, where he trained African orthopedic surgeons. Christopher M. Schroeder ’07, Boston, Massachusetts, has been appointed to serve as executive director of the Josiah Quincy Orchestra Program in Boston. Schroeder also serves as music director of the Cape Youth Orchestra, and he is a guest conductor throughout the United States, Europe and South America. He was recognized as a quarterfinalist for the 2019 Grammy Music Educator Award. attorney with Marshall, Conway & Bradley, an insurance defense law firm in New York. Jennifer D’Aquisto, M.Ed. ’14, Longwood, has been named the 2019 Florida Virtual School Principal of the Year. She has been instrumental in the growth of videoconferencing instruction across the organization, which offers technologybased education. Ryan G. Benson ’03, Fort Myers, has been elected as vice chair of the Florida Home Builders Association’s Local President’s Council. Also, Benson was named as a 40 Under 40 by the Business Observer (Fort Myers) in 2018. Marriages 1 Jennifer Fish ’10 to Matthew Bloom, Sept. 14, 2018. 2 Hayden Staley ’12 to Joshua Menendez ’12, Oct. 13, 2018. 3 Taylor GabrieleGoodwin ’14 to Christopher Mills, Aug. 2018. Success by the Numbers Darleen Opfer ’89 made her way to Stetson as a firstgeneration college student all the way from Spruce Creek High School, about 23 miles from campus. The short trip has taken her a long way. Opfer arrived hoping to become a teacher in special education. She remembers taking small classes, getting to know the faculty, gaining valuable classroom experience and, ultimately, receiving academic-adviser encouragement that led her to a doctorate at the University of Virginia in education policy studies. Today, Opfer has gone from special-education teacher and researcher to become a main cog in decisions about global education policy. All at seemingly lightning speed. From 2005 to 2011, she served as director of research and a senior lecturer in research methods and school improvement at the University of Cambridge’s Faculty of Education in England. From there, she landed at the RAND Corp., where she was director of RAND Education from 2011 to 2018. Additionally, through the years Opfer served as an adviser to the National Council of Educational Research and Training in India, and as a consultant for the U.S. Agency for International Development in South Africa, among others. A Communio/ Bank Focusecl On You. Births 6 Katheryn Wright ’02 and Clinton Bryant ’01, a son, Wesley James Bryant-Wright, Sept. 2018. 7 Annie Cline ’05 and Andrew Parr ’06, a daughter, Ansleigh Catherine, Oct. 2018. 8 Alyssa Payne ’17 and Zachary Prather ’17, a daughter, Valentina Tess, Jan. 2018.
for law school. Gunby, an international-studies major, participated in multiple studyabroad programs while at Stetson and has eventual plans for graduate school. (See Page 38.) They were married on Oct. 28, 2017. Chuck Hammet ’91 provides fleece blankets, free of charge, to children's hospitals as part of The Angel Foundation. STETSON is printed on FSCcertified paper.